Never Give Up: Why Is It Worth It "To Keep Living"? The month of September is coming to an end. I know that various initiatives have been taken to raise awareness about suicide and its causes during what has been designated as World Suicide Prevention Month (particularly on the day of September 10). 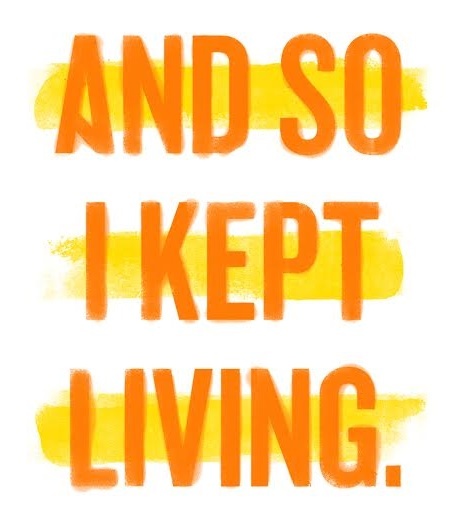 Our friends at TWLOHA ("To Write Love On Her Arms," see my blog post here) have a designated theme each year, and this September the theme has focused on people deciding to stay alive, deciding not to give up. Mental illness can be a relentless scourge that afflicts a person for reasons beyond their control. We recognize that it can reduce personal responsibility to the point where many suicides are not deliberate and fully free choices of self-murder. From a subjective point of view, death by suicide often is a consequence of the actions of desperate, compulsive, gravely depressed people. These people are afflicted by a complex and severe mental disability that hinders and distorts their perception of themselves and others, a disability with a significant neurobiological component that flares up and becomes crippling and degenerative because of negative experiences and the absence of medical treatment, adequate counseling, and/or basic human understanding and support. Suicide prevention requires everyone to become more aware of the sufferings of people with depression and related illnesses. I have made an effort to share my own experiences with this (see, for example, my BOOK) and I think it is important to stress that the struggle to keep living is acute and ongoing in various ways and on different levels of severity for mentally ill people. 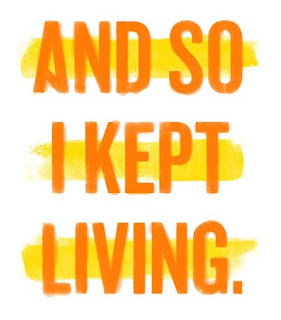 For some people, staying alive is an invisible heroic achievement every day. Even those who are not facing such immediate and total danger, however, have peculiar hindrances that they struggle against as they try to move forward in life. We all need to encourage and build up one another. Those who have been blessed with mental and emotional strength, however, have a special opportunity to share their gifts, to cultivate an active and affirmative support and service toward their afflicted brothers and sisters. Above all, we must all remember that the embrace of Jesus Christ brings an ultimate fulfillment to every aspect of our humanity, not by "solving" our human problems in some magic way, but by transforming us from within and making our gifts and our needs, our strengths and our weaknesses into paths toward communion. By the grace of the Holy Spirit, the compassionate and the vulnerable alike experience the mercy that renews all things, and gives hope in the midst of the most incomprehensible circumstances. As I ponder this interplay of vitality and fragility in the circumstances of life, I am reminded of the ways in which love proves itself both in the magnanimity of its human reach and in the (apparent) weakness of its mysterious self-emptying, through which it passes beyond the experience and understanding of this present age so as to win the victory that endures forever. It brings to my mind a young woman with an enormous heart, who was drawn so powerfully by Jesus Christ that she seemed to want to embrace the whole world. She had a joy that poured itself out in music and in a tireless enterprise of connecting with people by all the means she could find. Our beloved Christina Grimmie had a human strength and a gift for communication and encouragement. She also knew that she belonged to Jesus, and that all the value of her strength and talent came from Him. She was a very real person, with flaws, sensitivities, problems, and failures like anyone else -- very much an earthen vessel that nevertheless carried the treasure of Christ's love in a manner that communicated something of that love's heroic stature. Christina knew that His love could sustain the human heart, and thereby foster healing and bring consolation and strength to those who struggled to keep living. In April of 2014 she made a very short, spontaneous video that took its point of departure from eating disorders and self-harm issues but opened up from there. 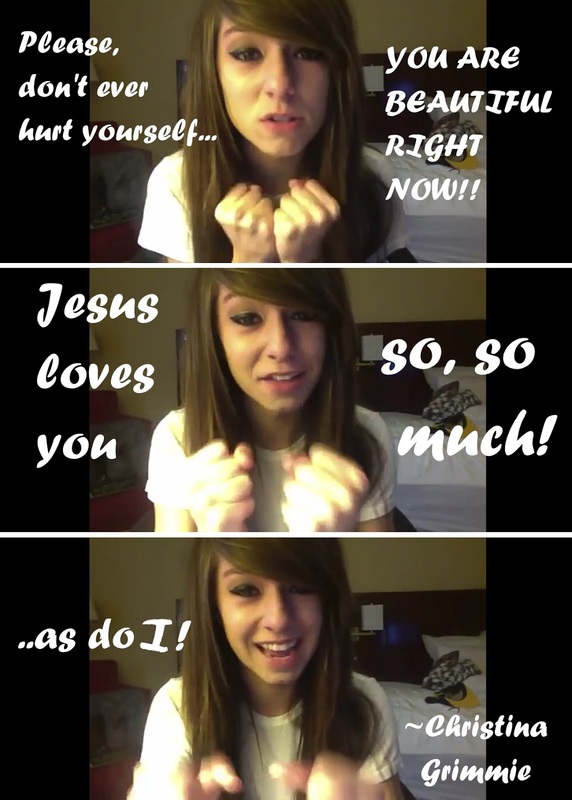 Anyone could articulate these kinds of statements on a video, of course, but what she expresses here has a palpable authenticity because it comes from within the context of her whole life as a daily risk, an availability to the people she met, a passion for Christ and her music and the people to whom she gave the gift of her music. In this meme I designed from the video, the first panel summarizes a slightly longer discourse, but the other two panels are her exact words that she felt were so urgent, so significant for affirming the value of all the people who were touched by her music, and indeed of every human person who might watch it. The video is still up on her YouTube channel along with everything else, but here is my graphic summary. It is something that strikes me very much. Christina never tried to sell her faith. When she did mention Jesus, it was to affirm a conviction that couldn't be expressed without an explicit reference to Him. Her own love, in its source and its urgency, its value and its significance as a gift to others, was inseparable from His love. This is the kind of love that is not afraid to open its arms to anyone, that is not afraid to open its arms because it always has confidence in the One whom it seeks to embrace. Such confidence engenders a real courage, a real audacity that is more powerful than all the harm that human beings can inflict upon others and themselves, more powerful than the violence that tries so terribly to negate it, but that cannot prevail in the end. The world needs this kind of audacity. The world needs this kind of love. 22 year old Christina Grimmie in concert earlier this year. She would stay long after every show not only to sign autographs, but also to spend time, take pictures with, and listen to everyone who wanted to meet her. She gave lots of hugs and welcomed everyone. On June 10, 2016 she opened her arms wide for a stranger in the meet-and-greet line at the Plaza Live theater in Orlando, Florida. He pulled out two concealed guns and shot her once in the head and three times in the chest. He then killed himself. Murder and suicide, both shrouded in mystery. We'll never know the whole story of the killer, but Christina died doing what she did all her life: welcoming a person, risking herself, giving unconditionally, loving. 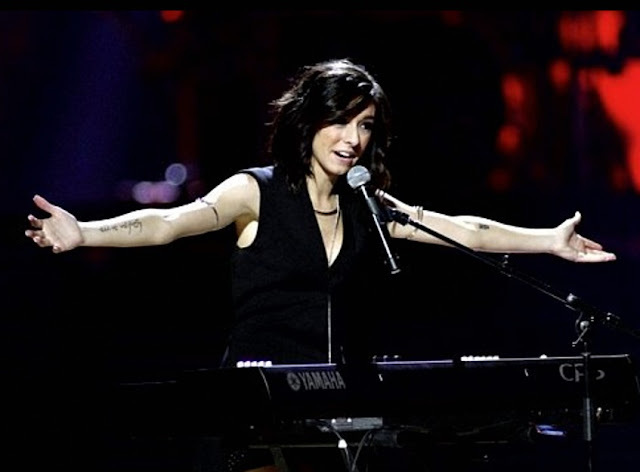 It has been so awful, so shattering and devastating for her poor family, friends, and the large number of fans all over the world who interacted with her on YouTube and social media, that "Team Grimmie" about which she said, "we are one big family." So heartbreaking, and yet how can we deny that the world--desperately--needs more of this kind of love?